Municipality of Clarington (Lower Tier Durham)Record Owner? Log in. Less than 50 miles east of Toronto along 25 km of Lake Ontario's northern shore. Established in 1974, Clarington is an amalgamation of the communities of Bowmanville, Newcastle Village, Courtice with the former Townships of Darlington (to the west) and Clarke (to the east). Natural Resources Canada in the Durham Region. 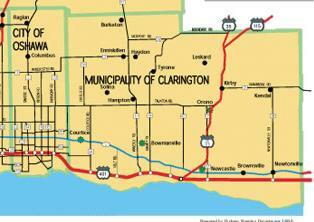 Have something to say about Municipality of Clarington (Lower Tier Durham)?